What’s In a Name? What’s In The Bottle? First the outside: The name of the company on the label, and on the cage don’t exactly match; never mind the actual logo. Back in November Tröegs unveiled their new branding along with a new name. What had previously been Tröegs Independent Craft Brewery is now Tröegs Independent Brewing. I am sure future cork and caged beers will have a unified logo but right now its interesting to consider the two names and logos side-by-side. In light of the slightly new moniker, the old one was a bit messy and too long. The new name, Tröegs Independent Brewing, on the other hand is only three words and feels cogent in comparison. The interesting part to me is the deletion of the word “craft.” I see this as forward thinking. With the craft beer industry maturing, what constitutes “craft” is becoming increasingly difficult to define. So much so that “craft” might now be meaningless beyond a somewhat arbitrary line regarding the number of barrels a brewery produces each year. Contrastingly, “independent” is of growing importance and is both easily understood and defined. Brewers all over are either selling off to the “macros,” buying each other, merging or entering into loose confederations to stave off buyouts. In my opinion, the Trogner bothers appear to be making a statement about their company in emphasizing “independence” over “craft.” I really like and support this message. The name of this specific beer is worth thinking about as well. While it is wholly accurate to state that the Troegenator in this bottle is aged in oak barrels, it fails tell the whole story. These were bourbon oak barrels. This caused a little bit of confusion during the announcement of this beer but it was easily cleared up on social media. This ale has an obvious yet subtle bourbon element right from the moment you open her up. Unlike some recent bourbon barrel aged beers I have enjoyed, this one is mellow right from the start and does not overpower your senses with boozy, hot, astringency. Instead, the bourbon follows the beer’s lead. Troegenator is leading this dance and the bourbon is swept along; allowing the ale to show off. That being said, the flavor is undeniably bourbon barreled with vanilla, some light coconut, and a sweet toasted/roasted maltiness. Mouth feel is rich and full with very tiny bubbles that are slightly prickly on the tongue. Dark fruit, nutty wood, and molasses notes come forward as the beer warms up along with a slight earthy tone. Nose is sweet with a wood and charred edge from the bourbon barrels. The clear, deep red toned ale provides a very long and lasting finish. That makes this a sipper despite no alcohol burn from the 10.8% ABV; it is stunningly smooth for a double digit beer. This beer tastes like it is at peak performance right now but hints that it is prepared to age with the best of them. Some bourbon barrel aged beers come out of the gate with a hot edge that needs years of rest to mellow out, thereby reaching full enjoyment only after cellaring. This one is ready now and yet will continue to mature for years. Post Script: Liz Murphy over at Naptownpint.com back in November wondered about the name change and thought there was little in the way of discussion about it. I think the reasons for the name change, specifically “Independent” winning over “Craft,” are obvious and stated above. But in the end, my thoughts are simply speculation. I wonder if the decision to not use the term bourbon on the label points to future iteration of a Splinter Troegenator but coming from the still under construction Splinter Cellar; not necessarily bourbon barrels. 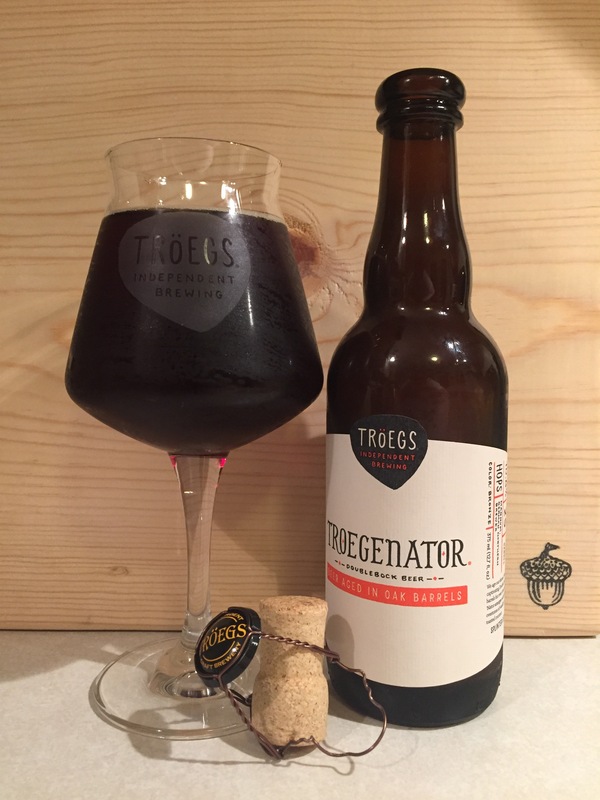 It should be noted that last February’s release of Bourbon Barrel-Aged Troegenator (750 ml bottles) did not have the word bourbon on the front of the label either. I still have two bottles of this tucked away and might open one soon.